2019 Sierra Reveal: What Do You Want To See From GMC’s New Truck? Since the Silverado and Sierra have been around, both trucks have largely copied one another in design and purpose, save for more luxurious options and the GMC’s Denali trim. But, with the 2019 Sierra reveal, things will likely change. GMC will debut the 2019 Sierra today with a largely different design from the 2019 Chevrolet Silverado and we may see even more from the pickup to differentiate it. But, we want to know what you want to see from one of General Motors’ most important vehicles. Let’s run down what we do expect from the 2019 Sierra reveal. Foremost, as mentioned, the pickup will not twin the 2019 Silverado in exterior design. That’s been apparent for months now. 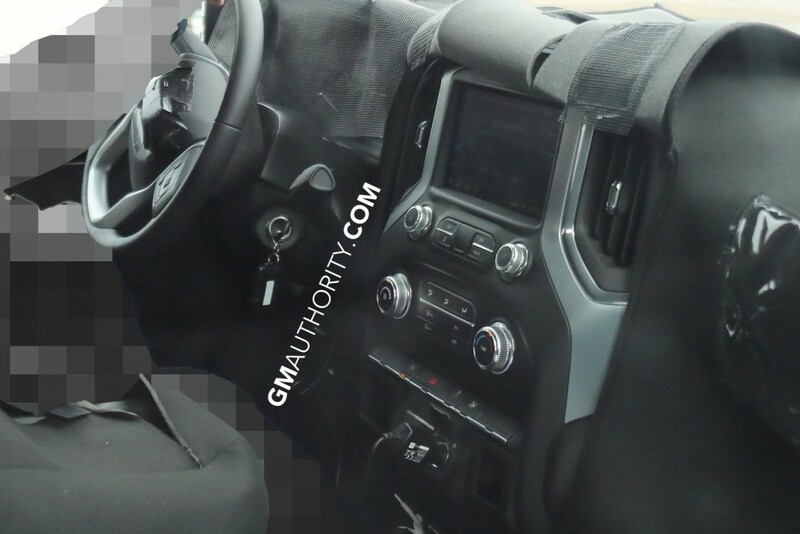 However, judging by spy photos, the trucks will share nearly identical interior designs. We previously said that’s a shame and could be a big factor in making the GMC Sierra feel like the more luxurious alternative to the Chevy Silverado GM wants it to be. We also expect an identical powertrain lineup to the Silverado, which we know includes a new 5.3-liter and 6.2-liter V8 engine equipped with Dynamic Fuel Managment. GM also announced a 3.0-liter Duramax inline-six engine for the Silverado 1500, and the 2019 Sierra should also benefit from the powertrain option. Other powertrains haven’t been announced for either truck, but the GMC reveal could shed light on others. Look for a breadth of models offered with the 2019 Sierra, just as Chevrolet worked to further define the market with eight separate Silverado variants to start. The top-of-the-line Denali model should boast even greater refinement than ever with serious luxury equipment. We could also see GMC embrace the Denali Ultimate model even more. Finally, the latest intel does suggest the 2019 Sierra will offer a carbon-fiber bed in some way. It would mark a major shift in the material’s usage at GM—and the industry at large. Carbon fiber is often reserved for sports cars and exotic vehicles. Utilizing the material in a pickup truck could significantly boost fuel economy and let GM cash in on best-in-class curb weight figures. 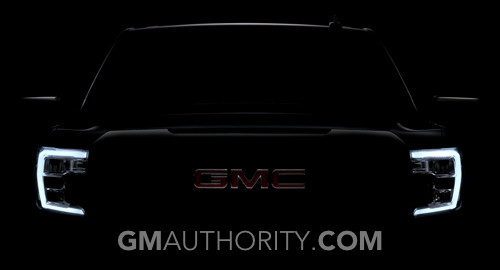 Go ahead and talk to us below and let us know what you’re looking for from the 2019 GMC Sierra, and stay tuned for the full reveal later today. I was hoping for more distinction between Sierra and Silverado, appears we’ll get that in some part. Hoping for more premium elements in the cabin including the likes of cowhide leather, real wood trim pieces, tech features that would keep a Cadillac company though wouldn’t favor powertrain differences, that’s one element I would like the same. The fiberglass bed being spoken of has me skeptical, am relatively satisfied with the materials choices made on the Silverado that would be okay to see on the GMC, but they’re gonna need some real wheel choices and a lot of them as this is probably the biggest and most significant way to make your truck ‘special’ amongst the others. Would like to see a difference in the powertrains. Yes most of the engines will be carryover but give the 5.3 the 10 speed along with the 6.2 and diesel. The exterior seems different enough to separate the 2 models but the interior needs more to differentiate them. The Denali needs to move much more upscale with real wood, more padded areas and a more upscale center stack. Otherwise I’ll wait for the reveal to see what they cooked up. Can you please ask why the interiors are the same in both brands. Can you tell them they absolutely need a Raptor killing brand with a tough name and even tougher looks. The S10 ZR2 is too lean and feminine looking. Men like tough bold trucks. The s10 ZR2 hasn’t been manufactured since 2004. Why are you bringing up trucks that are at least 14 years old? MY apologies I am talking about the new Colorado ZR2 is no where as tough looking as the soon to Appear Ranger Raptor. Gsm is my only brand my family has bought. Over 45 Vehicles of Different GM brands we have owned. So yeah… I pray GM comes out with a full size Raptor Competitor. I’m waiting to buy a truck from GM PRAYING THEY HEAR Our Pleas. I will be buying a new GMC truck by fall and I mean the new model. But if no Raptor Competitor is mentioned then I WAIT until one comes. I’m not spending $70000 on a truck until I get what I want. There are tons of my friends I know who are wanting one. Some have jumped to Ford’s Raptor already sick of waiting. Come on GM LET’S DO THIS ALREADY!!! Would like to see a turbo engine as well. All good, no Turbo V6s please. The 5.3 and 6.2 are your ‘turbo’ answers to Ford. Super Cruise and Massage Front Seats. If it has those two items, I will be trading my 2017 Sierra Denali this fall. Agreed if has massage seats and all the other goodies that ford offers I will get a GMC rather then a Ford. WTF, seriously? Just go buy a German luxury sedan. Massaging seats, it is sad to see what the pickup truck has come to with some people (solely an image vehicle). I’m not sure a luxury sedan would work all that well on the gravel and dirt roads that I live on in rural America. Let alone haul anything that I need to on the farm. My point is that when I am spending 60-70k on a truck I expect it to be loaded with options and creature comforts. I take my truck on 4+ hour trips one to two times a month and it would be nice during those trips to have features like messaging seats and adaptive cruise. I’m sure there is going be a lot of disappointed people after this reveal. S10 ZR2 or you mean the new Colorado ZR2? The Colorado ZR2 looks tough and agressive. I would love: large 1 piece sunroof (like XT5), massaging front seats, heated and cooled rear seats, 14 speaker Bose sound system, a “tailgaters bed” like the Ridgeline (exterior speakers, storage, 2-way tailgate), and a gauge cluster with more info. Interior here looks to have better grade leather than Silverado High Country, though design could have gone further in IMO – but I prefer Chevy’s wheel well openings. I like this car, it is very elegant style and very polite. I really like your blog. Very interesting articles can be read.